Labour Day is more than just the last long weekend of summer before the kids head back to school. It is an important day of the year to reflect and celebrate the gains and achievements made on behalf of our workers. In Alberta, CUPE members have diligently stood together to improve conditions for working Albertans. Today we have higher wages and better benefits, as well as vastly safer and healthier work places. It is every worker’s right to a safe and healthy workplace. This hasn’t always been the case. These have been hard-fought gains made over years of battle. But when CUPE raises its collective voice to stand up for workers’ rights and a better life for everyone, it resonates in workplaces and communities across Alberta and Canada. We are the country’s largest labour union, and we are committed to our fight for a fairer and more equal world. Around the world, a wave of right-wing governments threaten to legislate away the rights of workers, privatize public services and fundamentally redefine how governments serve their people. That threat can be found right here in Alberta in Jason Kenney and his United Conservative Party of Alberta. A provincial election will be held by next spring and CUPE Alberta will do everything it can to re-elect the NDP, whose labour-friendly policies improve conditions for Alberta workers and support a more equal and inclusive society. Thank you to all CUPE activists, leaders, and staff across Alberta, who fight tirelessly to make our jobs and our communities better. You show up and make a difference. 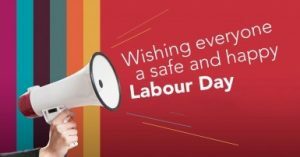 On behalf of CUPE Alberta, we wish you a very safe and happy Labour Day. Lethbridge District Labour Council barbecue, bouncy castles, face painting and live entertainment, 11 a.m. to 3 p.m. Kinsmen Park, 1009 – 9th Avenue South.